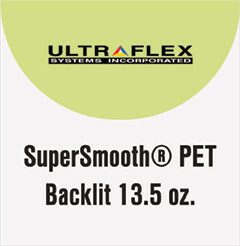 SuperSmooth PET Backlit™ 13.5 oz. SuperSmooth™ PET Backlit is a 13 5 oz smooth scrimless flat banner material. Ideal for backlit light boxes amd indoor/outdoor backlit applications. Available in widths from 54” – 126”.